It's No-Shave November, time to celebrate the best beards in professional sports. Hail to the hirsute. No-shave November is finally upon us. It's the time of the year when fabulous facial hair isn't just allowed, it's encouraged. To fully prepare your facial follicles for a month of unabated growth, we put together a list of our favorite current athlete beards. It's not just about length and bushiness; it's also about style, uniqueness and overall look. With that in mind, let's check out some great athlete beards. The stereotypical quarterback is a good-looking, clean-shaven dude who looks like he'd be as comfortable on the runway as he is in the shotgun. Well, Ryan Fitzpatrick is here to shatter your expectations. The New York Jets quarterback has recently been sporting the facial hair of an 1800s pioneer. While he might look more suited to trapping squirrels than slinging touchdowns, Fitzpatrick has the Jets off to a solid start. Just don't be surprised when he attaches a raccoon tail to the back of his helmet. James Harden lost out to Steph Curry in the NBA MVP voting last season, but he was definitely the league's MVB—Most Valuable Beard. Harden began growing his facial hair in 2009, claiming he was simply too lazy to shave. Six years later, his iconic beard is plastered on everything from t-shirts to coffee mugs. It even has its own Twitter account! Although he's currently a free agent, Brett Keisel has a beard that is too legendary to leave off this list. In my mind, Keisel has always had a beard. He emerged from his mother's womb sporting a proud, full beard, and it's been there ever since. But the truth is that Keisel's early career facial hair was rather unremarkable. Here he is sporting a short, well-kept beard on a program cover from 2006. It's nice, but not extraordinary. But in the later stages of his career, Keisel decided to fully commit himself to his beard. Soon enough, he was sporting a monstrous reddish-blonde face curtain that put Grizzly Adams to shame. I have no idea how he can even put a chinstrap on that thing. Keisel holds an annual event in Pittsburgh where he shaves off his beard to raise money for a local children's hospital. He has indicated that he would return to the NFL this season if he got a call from the Steelers, and what better time to make a comeback than No-Shave November? You'd better believe that Tom Brady's new facial hair earns him a spot on this list. Perhaps he grew it to give off a more rugged, jagged vibe after the Deflategate saga, but Brady's beard is unique. For one, it looks like he faces a common beard-growing challenge—his mustache doesn't want to connect with his cheek growth. His neck hair is also looking pretty shaggy. Is this a perfect beard by traditional standards? No. But it's a new look for Brady, and he's playing his best football in years. If the Patriots keep winning, the whiskers will undoubtedly stay. 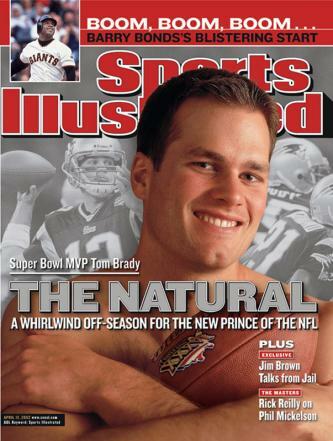 Baby-Faced Brady: Why does he have his shirt off? No list of beautiful athlete beards would be complete without Brian Wilson. Now a member of the Dodgers organization, Wilson and his forest of facial hair rose to prominence when he was the closer for the San Francisco Giants. Between 2008 and 2011, Wilson racked up 163 saves and garnered tons of attention for his ever-growing facial nest. Although injuries have slowed Wilson down in recent years, his beard has continued to grow at a furious pace. It's now so long that he has to use a blue scrunchie to wrestle it under control. And don't expect him to cut it any time soon. Wilson reportedly broke off negotiations with the Yankees because he wouldn't adhere to their "no facial hair below the lip" team policy. José Bautista has slugged nearly 300 home runs in his MLB career, and most of them have come when he was rocking serious facial hair. According to Bautista, he hasn't shaved clean since 2011. Bautista's beard recently achieved immortality when a YouTube video showed a young imitator calling his critical home run in the 2015 ALDS seconds before it happened. If your beard inspires young fans to draw it on their own faces, you must be growing something right. Dallas Keuchel had a breakout season in 2015, compiling a 2.48 ERA and helping the Astros to their first playoff berth since 2005. But Keuchel's play is not the only thing that distinguishes him among his peers; his massive beard is unique, too. One thing I love about Keuchel's beard is how its reddish-orange color perfectly complements his Astros uniform. With Harden and Keuchel both balling out in the same city, Houston has become the unofficial Athlete Beard Capital of America. The following athletes sported some bodacious beards, but they just missed the cut. There's always next November.